After I attended the German Genealogy conference last month, I was so excited that I ordered a microfilm from the big library in Salt Lake City -- this costs $8.99 for every film you order, and if you get no new information from it, well, say goodbye to your $8.99. But I went ahead and ordered the "Kirchenbuch Katholische Kirche Wolfach" -- the church record book for the Catholic church in Wolfach, Germany. 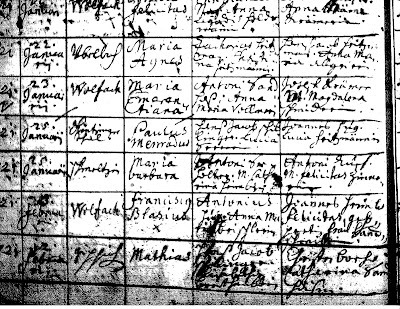 I had tried asking for information from Wolfach on the email list of genealogists from Baden-Wuerttemberg, but got no response, so looking at the church records myself seemed like a good idea. The Salt Lake City family history center sent the microfilm to my local family history center, housed in the local LDS temple. The line that is of interest to us is second from the bottom -- this is the baptismal record of our (EDC's) 5th great-grandfather, the ancestor of our dad and Grandma Ortman. You might notice three things that make reading this entry difficult: 1) the general condition of the record book (the entry is from 1721) with that kind of blot over some of the writing; 2) the writing is in Latin, not German (though this is not a big obstacle); and -- the biggie -- 3) the entry is written in a script that looks to be impossible to read. Sponsors (=godparents): Joannes Grünle, Felicitas Gebhardin, Frau Landschreiberin. In looking through 25 years of records, this is the only instance I can find of anyone with the name "Blasius," and the time frame is right, so I've gotta go with the idea that this is him. (We're lucky his name wasn't Johannes, or I would have had to spend many more hours searching, because there are a million of those.) So, new information, he had a first name of Franz, and his parents were Anton Hug and Anna Maria Brischler ("Brischlerin" is the feminine form of "Brischler".) The lady who looked at it said the family name was Hu_er, so we're going with the idea that the missing letter is "g." Gotta be, right? There's no issue between "Hug" and "Huger," because spelling was pretty random in those days and almost every name has variants. 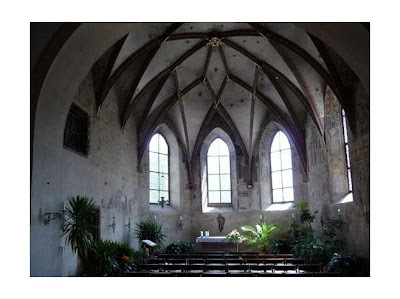 Here's a picture of the old part of St. Laurentius church in Wolfach -- this part of the church has been there since the 1400's, which would make it exactly where Blasy was baptized. Imagine them standing there -- amazing. Blaise, who had studied philosophy in his youth, was a doctor in Sebaste in Armenia, the city of his birth, who exercised his art with miraculous ability, good-will, and piety. When the bishop of the city died, he was chosen to succeed him, with the acclamation of all the people. His holiness was manifest through many miracles: from all around, people came to him to find cures for their spirit and their body; even wild animals came in herds to receive his blessing. In 316, Agricola, the governor of Cappadocia and of Lesser Armenia, having arrived in Sebastia at the order of the emperor Licinius to kill the Christians, arrested the bishop. As he was being led to prison, a mother set her only son, choking to death of a fish-bone, at his feet, and the child was cured straight away. Regardless, the governor, unable to make Blaise renounce his faith, beat him with a stick, ripped his flesh with iron combs, and beheaded him. Neat, huh? 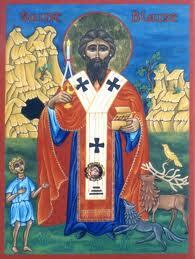 And what delighted me most was finding out that St. Blaise's feast day is February 3rd . . . the exact day that Franz Blasy was baptized! That's why he has that particular name! 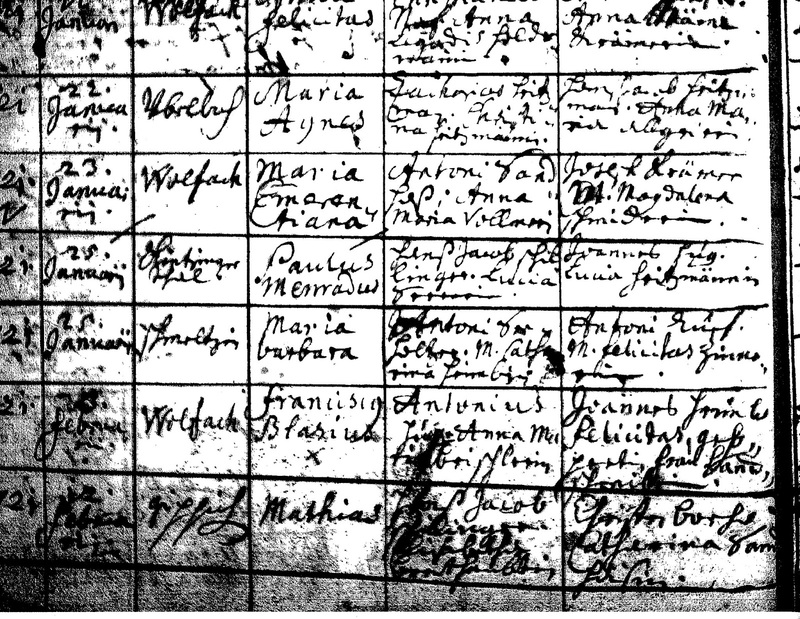 This is what I love about genealogy -- that little moment when there's a "click," and you suddenly understand something about the thoughts and motivations of people who lived almost 300 years ago.